Some time ago I had a trip planned to Central America and Colombia and I needed to bring with me a machete which would really mow down the brush and anything else that got in my way. Since I had experience with Condor tools and knives I decided to find out if they had something big and mean for me to carry into the jungle. I walked into the store and there it was, the perfect tool and weapon anyone walking in the jungles could ever need. The Engineer Bolo Machete stared back at me and we fell in love. Fifteen inches in length with the classic Condor design on the blade, half hammered texture and smooth towards the edge. 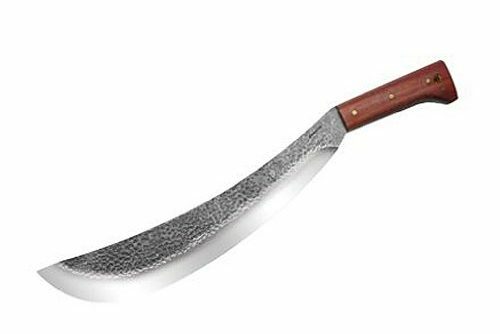 The full tang blade made of 1075 High Carbon steel looked fierce and with its 3/16 width, it could cut through anything. I swung the monster a couple of times to test its balance and it was perfect. The blade was not a joke either it was sharp and went all the way from the machete’s tip to the handle. That is a lot of cutting edge when you need it. The handle is made of hard, resistant walnut which is shaped just right for a good grip and has enough room in case you need to swing with both hands. It is held in place by three very strong brass rivets that are sanded into the walnut so you do not even know they are there. 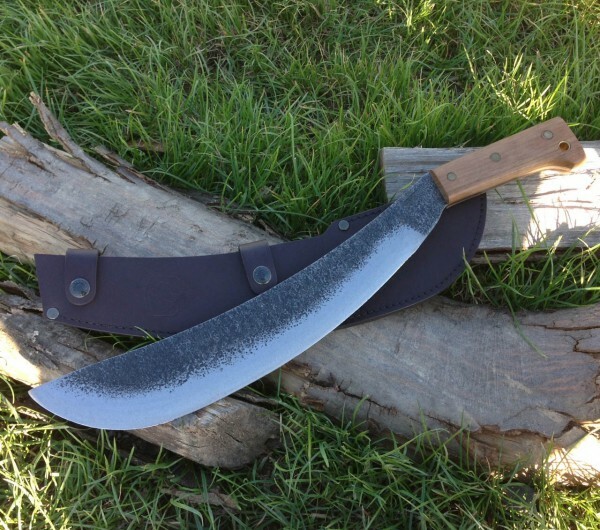 The leather sheath came equipped with a swivel belt loop which keeps the machete pointing the right way all the time. The price was also very reasonable so I bought it for the trip. Once down south in the jungle I found out I had made the right choice on the first day. We were on our way through jungle paths in search of some Mayan ruins and the bush had grown all over the path so we had to clear it to walk through. I took my Bolo machete and started going at it. The blade was perfectly sharp and balanced to the point where I did not miss one single strike, every one of them cut deep and true. So I thought this is nothing out of this world, all we cut down was brush and banana plants, I could do that with a kitchen knife. When we reached the spot where we would camp I volunteered to get fire wood, I intended to chop down one of those medium size trees I had seen close to camp so I went out to do it. 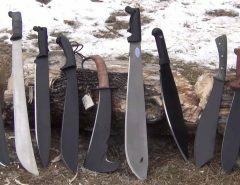 Again the Bolo Machete amazed me; it cut through hard wood like a finely sharpened axe. I have taken the machete on several trips with me and I have never been disappointed. The only inconvenience I found, which is no big deal, is that Carbon steel does not like to stay wet which is a bit of an issue in humid areas, if it does rust will appear soon, so keep a rag close by and keep it dry and make sure you maintain it and you will have a tool and weapon for many years to come. I do consider this machete to be the best machete. Check today’s price of the Bolo.